'ello..'ello..'ello..so nice of you to pay me a visit then!!! I was born in Leigh Lancashire, and for those of you who aren't sure where that is..I am sure you have heard of Liverpool, well LEIGH is not far from there,(its between St Helens and Salford)......and definitely 'not' in Greater Manchester!! I have memorable moments of my home town, the coalhouse in the backyards, the cobble-stoned back lanes..and the ice cream cornets with raspberry topping. I attended kindergarten at Pennington School (1961-62),the school is just over the Leigh bridge and sits next to the canal, (and is still a school today, I'm pleased to say). I was only there for a short time in my life, and I can't remember my teachers name? ?..but she had short white curly hair and I remember her telling the class that I was moving to Australia, and she said I was a lucky girl. She must have been a nice teacher, as I don't recall not liking her and I can still see her smiling face in my minds eye. Oh, I enjoy a good laff, and I can never get enough Lancashire humour, hehe....'Morecambe and Wise' are undoubtedly the best comedy duo, though they too have passed on, there humour still 'Brings me Sunshine' hey-eyyy!!.. CLICK to download 'Morecambe and Wise' song.. If you are a Lennon fan then click onto my LEGEND link, if not then click the NO link! Use the BACK ARROW on your BROWSER, as not all links return to this page. 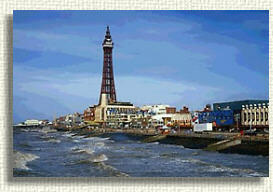 Born'n'bred in Leigh, my Uncle Edwin is the real 'LEYTHER ARTIST'! Muzak ~ to my ears!! If you like John Lennon, then visit this page! NO! .......did you say No? So, you don't like Lennon eh!..well there's nowt much to say then..or is ther'? The place of my birth, LEIGH..its local schools. Put kettle on then....tea up! ..its the local paper from my beloved hometown. Laurence Steven Lowry, the famous Lancs artist who lived in PENDLEBURY. 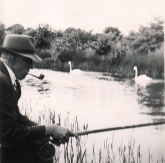 My grandad loved to fish, he made his own rods..they were the first rods that could be taken apart, into three pieces, for easy carrying. He also loved football, he played for Pennington Scouts 1925 and St Helens. In his later years he enjoyed bowls and was good at it too..and I have all his trophies. Residing in Australia....with Leigh in my heart !! "When you hear Big Ben, your home again!"